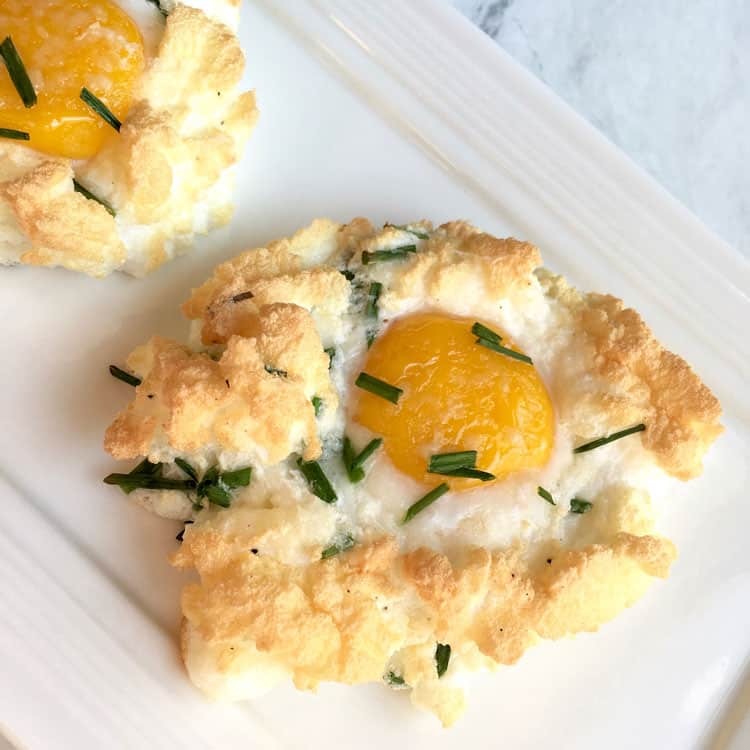 Asiago Cheese Cloud Eggs are a fun and tasty keto egg recipe that you’ll love to serve for breakfast or brunch. If you haven’t heard, the keto diet is a “low carb, high fat” diet that has skyrocketed in popularity over the last year. It seems to be getting more and more popular by the day, and food blogs have taken notice by posting an endless stream of mouthwatering keto recipes (like the one in this post!). What I love about keto recipes is that they can be enjoyed by anyone, not just by those who are on a keto diet. Keto recipes are rich, flavorful recipes that in no way taste like diet recipes, so even the pickiest “I don’t want to eat diet food cardboard!” eater will enjoy them. Due to their high-fat, low-carb nature, eggs (preferably pasture raised) are a staple of the keto diet. But let’s face it: eggs can get boring when you eat them day after day. Take a look at these fun, fluffy eggs (and they’re only halfway through the baking process here). This is not your run-of-the-mill keto egg recipe! This keto egg recipe nestles an egg yolk in an egg “cloud” made from stiffly beaten egg whites that have been gently folded with finely grated Asiago cheese and finely chopped chives and then baked. The two different egg preparation methods make them such an enjoyable keto breakfast recipe because, while they’re heavily egg-based, they’re different enough that they don’t quite feel like an egg recipe. 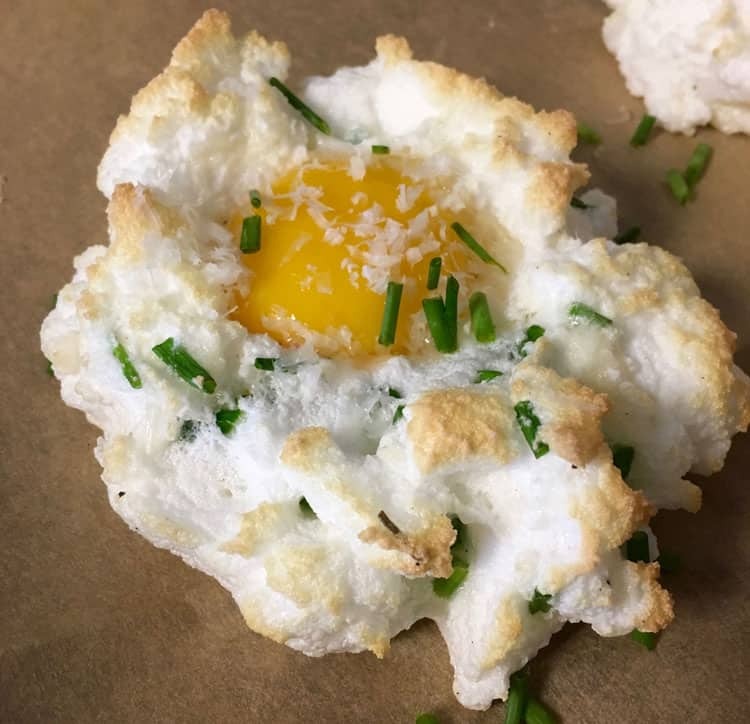 If you hadn’t heard of cloud eggs before landing on this recipe, you may have initially thought of eggs cooked in a cut-out hole in a piece of bread. That recipe is referred to as eggs in a hole, eggs in a nest, or eggs in a basket (and probably some other name I can’t think of right now — it has quite a few!). Cloud eggs are different in that they don’t require bread, making them an excellent keto or low carb recipe. However, cloud eggs are sometimes served on a piece of toasted bread, so feel free to serve them that way if you’d prefer. This makes them a highly versatile recipe if you’re serving to a crowd with different dietary preferences. Those who prefer to eat keto or low carb can have them as is, and those who don’t can eat them on top of bread of their choosing. No matter how you eat your Asiago Cheese Cloud Eggs, I think you’ll be quite pleased. Eggy and cheesy… it doesn’t get much better than that. If you would like to see more keto breakfast recipes (or keto recipes in general), please let me know! 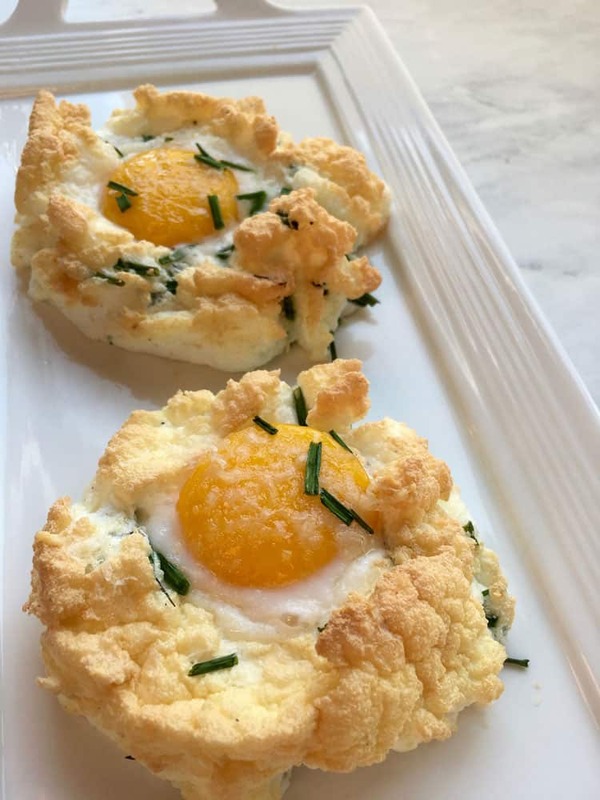 If you're looking for an easy keto egg recipe, try Asiago Cheese Cloud Eggs. Great for non-keto dieters too! Move your oven rack to the center position and preheat the oven to 450°F. Prepare a large, rimmed baking sheet by lining it with parchment paper. Set aside. Crack and separate eggs. Place the egg whites in a large mixing bowl and reserve the yolks separately. (For best results, do not place egg yolks in one larger bowl; reserve them individually in small dishes.) To taste, season egg whites with salt and pepper. Beat the egg whites until stiff peaks form using an immersion blender or hand mixer. Make sure to scrape the sides of the bowl with a spatula during this process to incorporate all egg whites. Gently fold in 2/3 of each the chives and the Asiago cheese. Be careful not to deflate the beaten egg whites during this process. Onto your baking sheet, spoon the egg white mixture into four equal-sized mounds, leaving plenty of room in between each one. Indent the center of each mound with the back of a spoon. Place baking sheet into pre-heated oven on the center rack. Bake for 3 minutes. Remove baking sheet from oven after 3 minutes and transfer one reserved egg yolk into the indent of each mound. Sprinkle half the remaining chives and Asiago cheese onto each mound. Return baking sheet to oven and bake for another 3 minutes until the whites are a golden brown and the yolks are set. 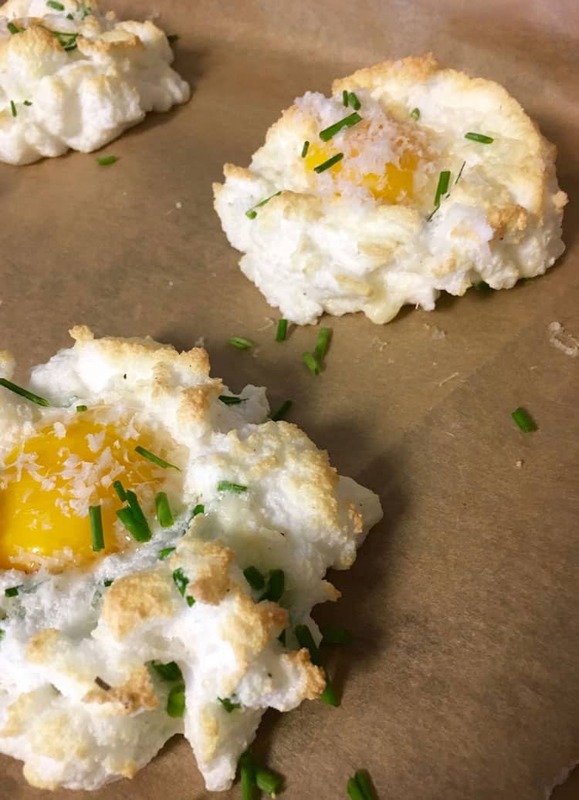 Remove baking sheet from oven and sprinkle remaining chives and Asiago cheese on the egg clouds. Serve immediately.